Looking at the high rises north and south of my pool chair, I’m glad that our Myrtle Beach hotel is on a stretch of coastline surrounded by homes rather than tall buildings that block out the sun. It’s quiet and peaceful and still feels like nature, rather than concrete, dominates the landscape. 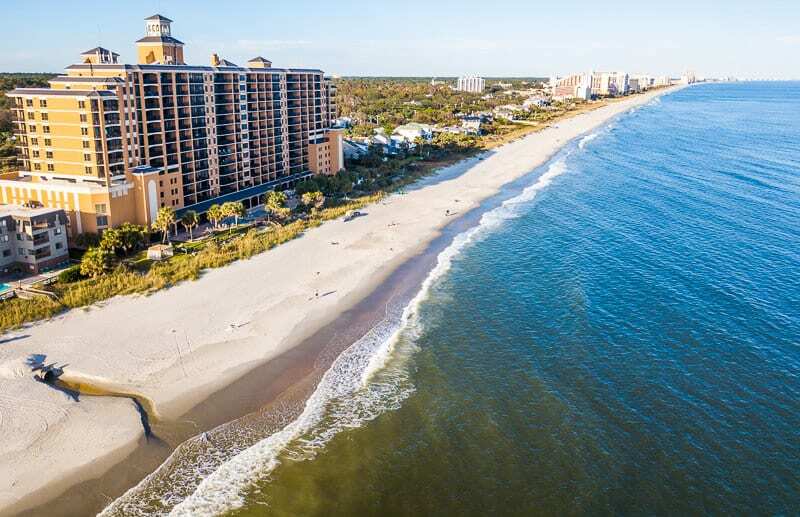 October is a great month to visit Myrtle Beach on the coast of South Carolina. The summer sun still lingers but without the stifling humidity that sends you scurrying for the AC. The pool is not overrun by school kids enjoying their vacation and the girls almost have the lazy river all to themselves. The ocean dumps small waves to shore, the rhythmic sounds wash away the stress I carried here alongside my suitcase. That’s the beauty of a beach vacation at any time of the year. I think it’s almost as if your psyche knows the power the ocean has to heal so it tightens your tension so that by the time you reach the healing ocean, the waves can strip all of it from you at once. It doesn’t take long until it all comes out and I’m left with just peace and easy breathing and a connection to nature and the present moment. That deepens for the rest of our trip as we return to nature, kayaking, walking and climbing trees. While I could have stayed on that pool chair for our entire three days in Myrtle Beach, SC, I think you and I both know that’s a family vacation that would end up feeling a little bland and monotonous. A vacation needs a healthy balance of relaxation and adventure for it to be truly memorable. 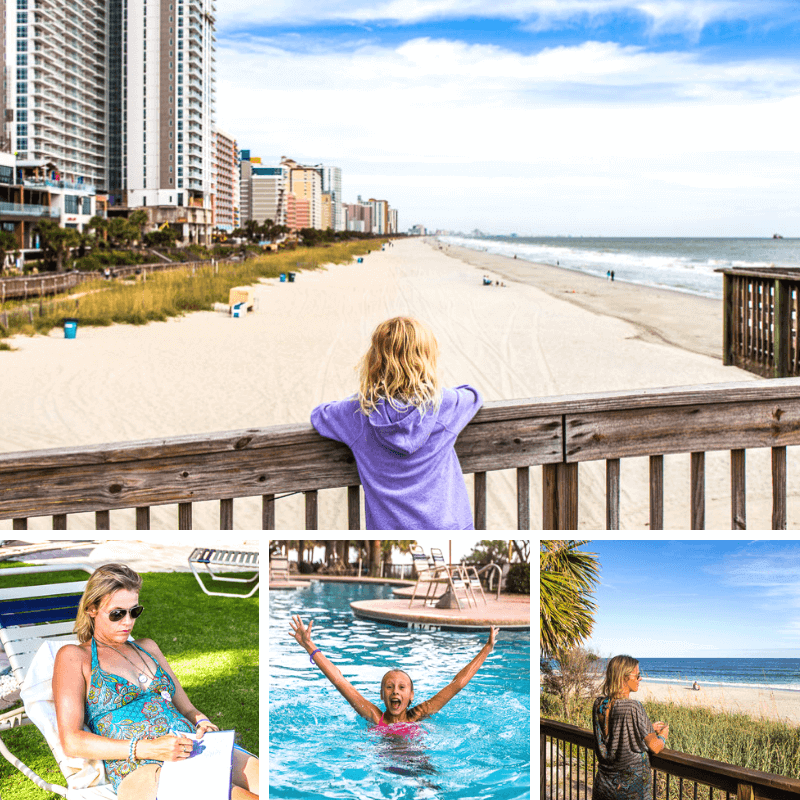 So after I had unwound for an entire afternoon by the pool, we were ready to head out and experience some Myrtle Beach activities – both on it and beyond the beach! 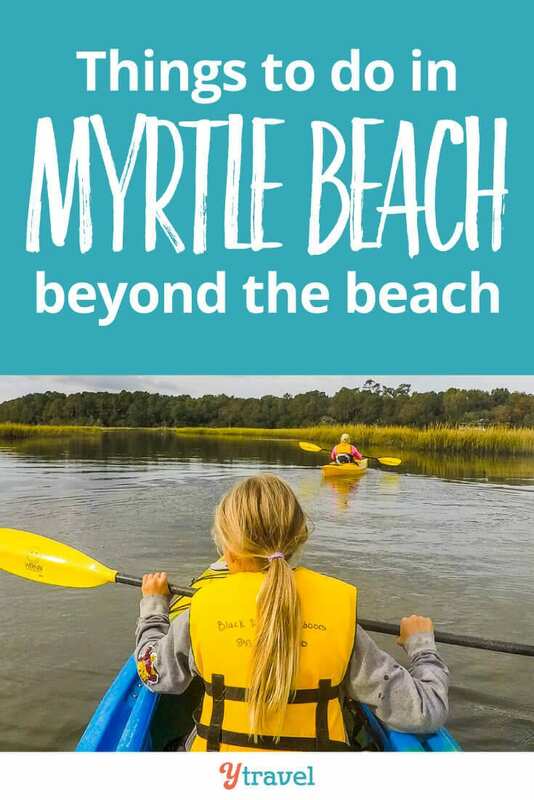 We visited the destination on a paid campaign with the Visit Myrtle Beach CVB. So what is there to do in Myrtle Beach, besides just the beach? 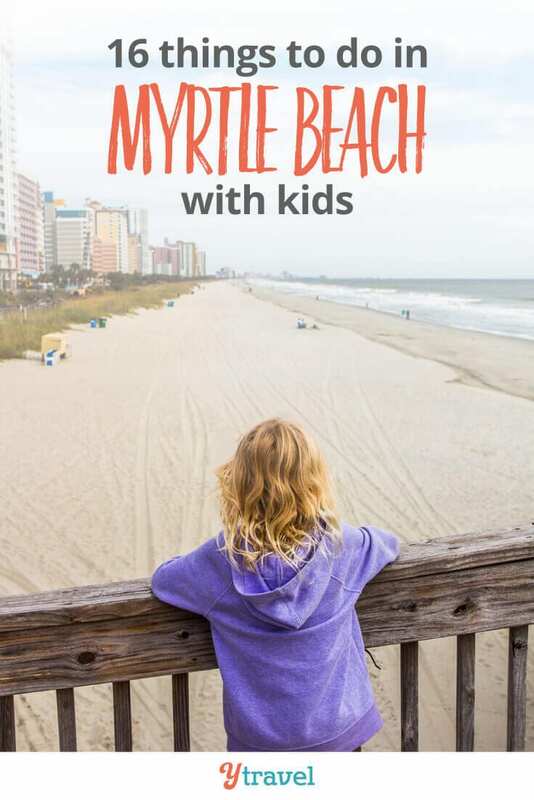 Let’s discover some of those regions and all the fun things to do in Myrtle Beach with kids. 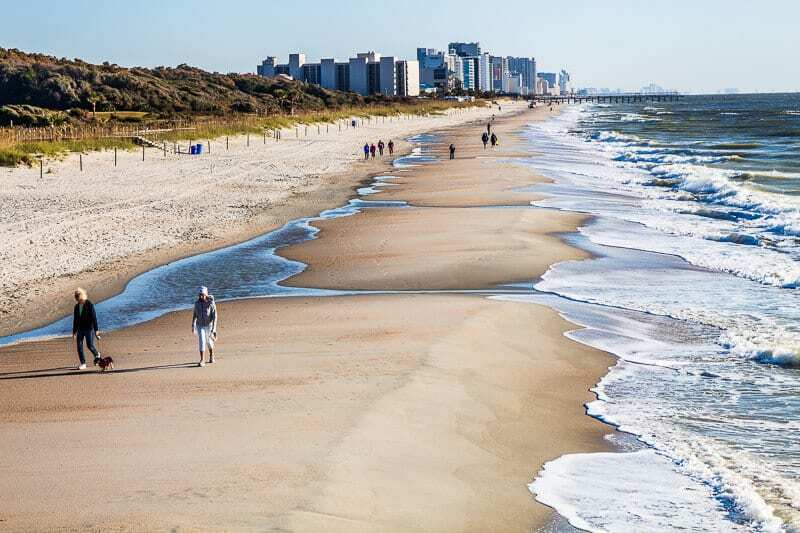 You cannot visit Myrtle Beach and not experience the gorgeous 60-miles of coastline. 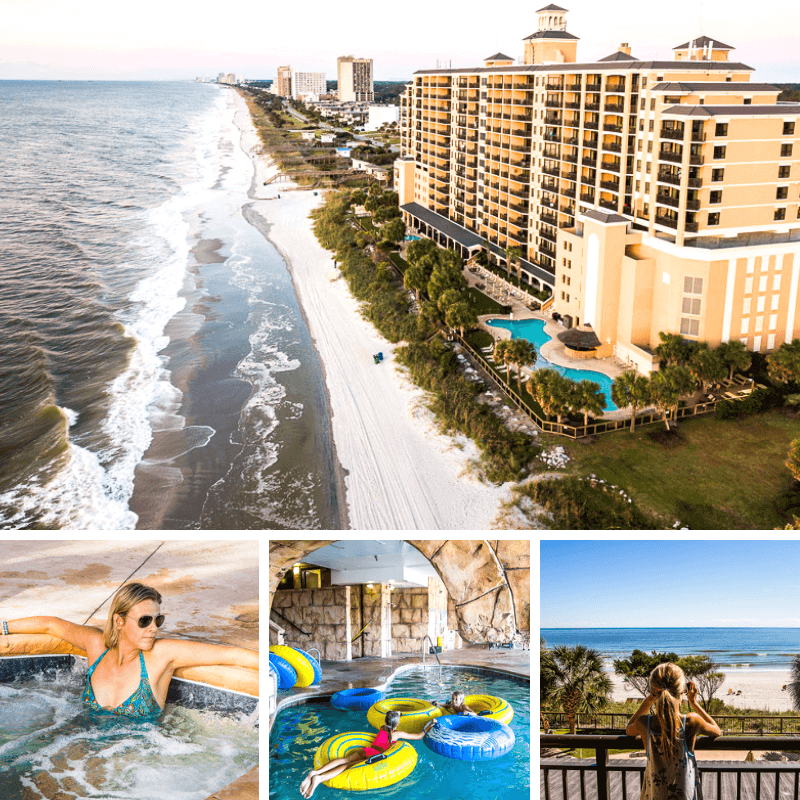 It’s known as the Grand Strand and is home to 14 distinct communities that offer something special to the region. 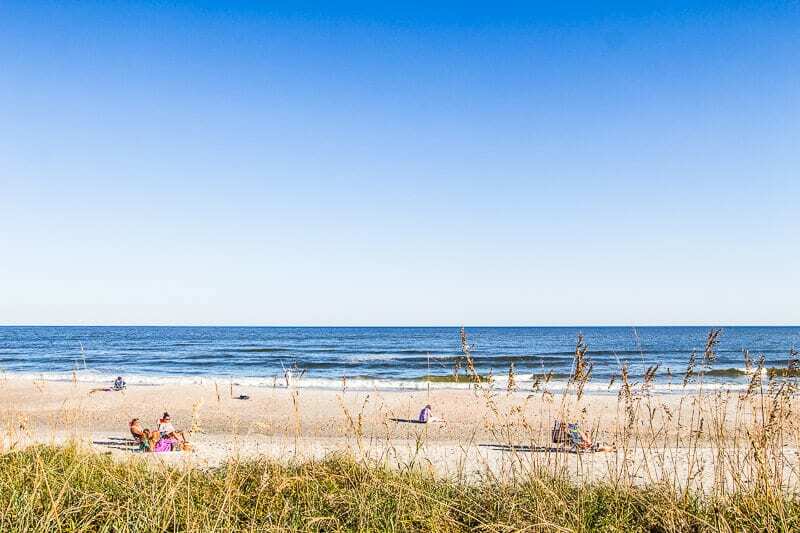 From the pristine natural beauty of Huntington Beach and Myrtle Beach State Park, to the surfing breaks on North Myrtle Beach, and the family-friendly Cherry Grove Beach, you can find the perfect beach experience for you. 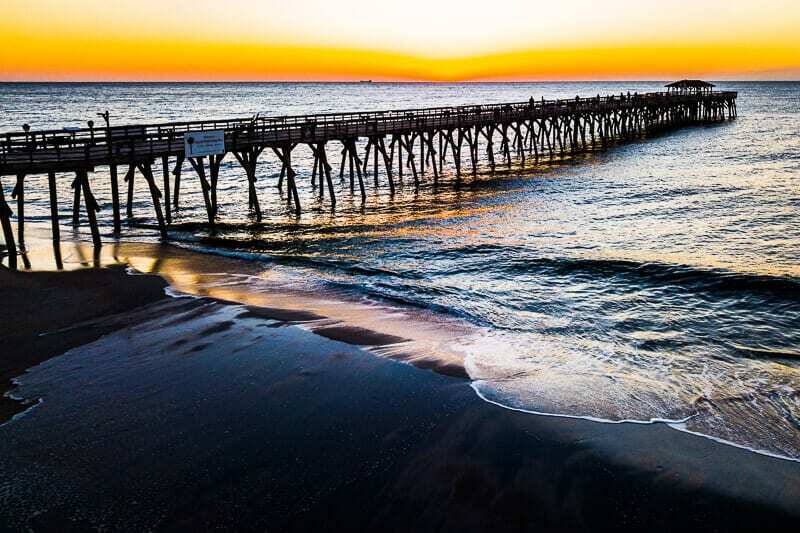 When it comes to free things to do in Myrtle Beach, you can’t beat time by the ocean! A mile of natural beachfront, a fishing pier and a magnificent rising sun. What more do need to start your day in the most joyful way? 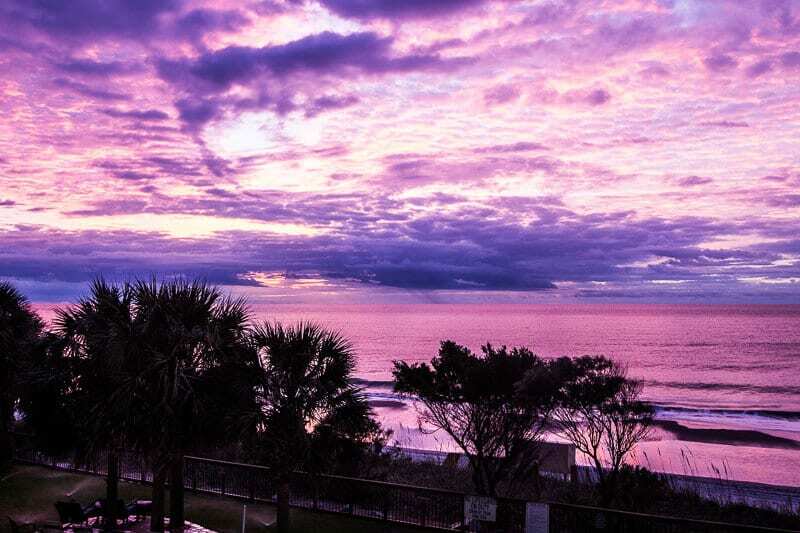 Head down to Myrtle Beach State Park, to watch an ocean sunrise. You’ll appreciate this one-mile slice of preserved natural beauty nestled between the high rises. Enjoy a walk along the beach or the winding boardwalk protecting the dunes and nesting sea turtles. You can even walk along the pier and enjoy seeing what the fishermen pull in. The girls were excited to share all they had learned from our morning with Ranger Ann on the fishing pier in the Myrtle Beach State Park. After learning about (and holding) blue swimmers and hermit crabs and jellyfish we walked along the boardwalk to find monarch butterflies to tag, but the windy conditions were keeping them away. Ranger Ann was very enthusiastic about the region and sharing her passion for the local wildlife and fauna with us. I loved how she subtly weaved in messages of conservation and how small acts by individuals can make positive changes. Myrtle Beach State Park is 312 acres on the city’s south end in a gorgeous oceanfront maritime forest that reminded me of the natural bush you’d find on many of our beaches back home in Australia. It receives an estimated 1 million visitors a year, few of which were present when we visited. I’m so glad they thought to preserve this place in 1936 when it became South Carolina’s first state park. 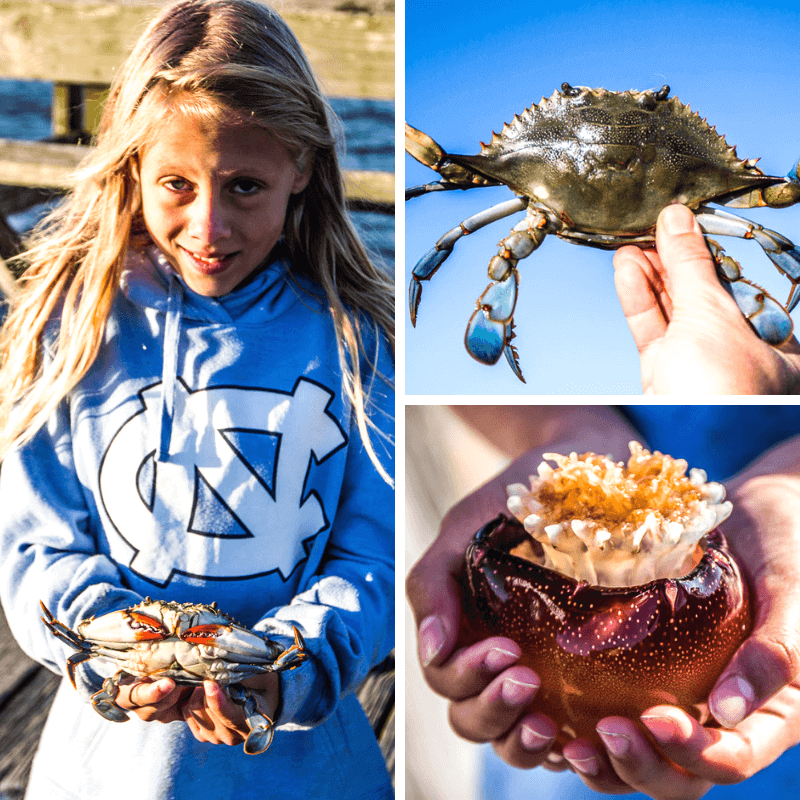 Joining one of the ranger programs is definitely one of the most educational and fun things to do in Myrtle Beach with kids. Children of all ages will enjoy it. There is a campground in the State Park and other cool programs like sunrise and sunset beach yoga. 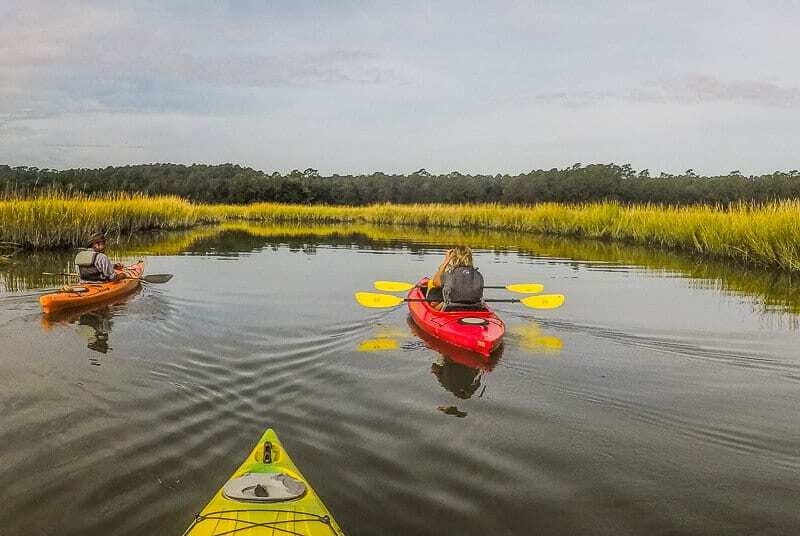 This has to be one of the most fun things to do in South Carolina for those that love the outdoors! We started our guided kayak tour through the salt marsh with our guide Paul telling us that Huntington Beach State park has some of the best bird watching on the East Coast. As an Aussie we know what it’s like to be surrounded by an abundance of birds, each with their own personality and quirks. The marshlands were thriving with birds such as egrets, herons, cormorants, eagles, vultures and osprey. We even saw a kingfisher standing on the tip of the grass. It looked so much like its relative, our very own kookaburra. Unlike the kookaburra, this kingfisher is fish eating bird and doesn’t have the laugh of the kookaburra, more like an evil cackle. For two hours we paddled under the warm sun through the marshlands learning more about the history of the area and the ecology of the marshlands. It didn’t end up being an alligator adventure for us, as they were starting to move to warmer waters. During the warmer months, you have a good chance of seeing them out in the marshlands doing a little lunch hunting. Don’t worry, they are not interested in you! 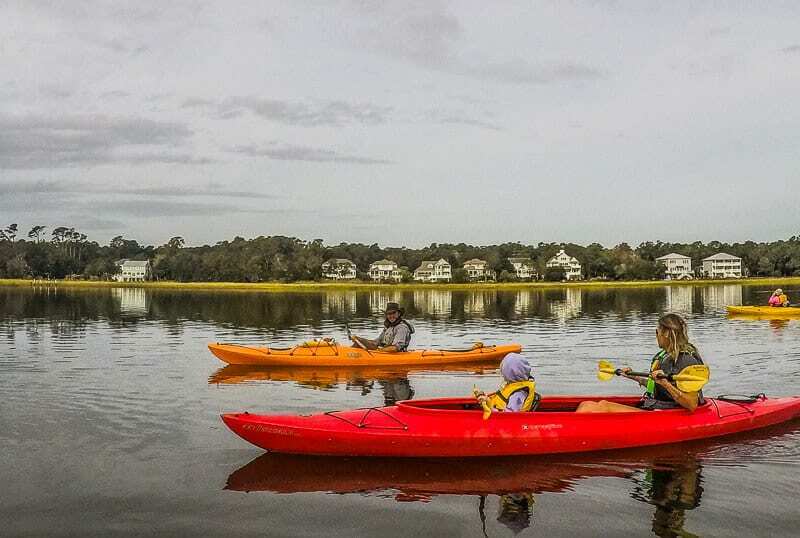 Put this on your list of family things to do in Myrtle Beach, beyond the beach! We did this tour with Black River Outdoors Kayak Tour. 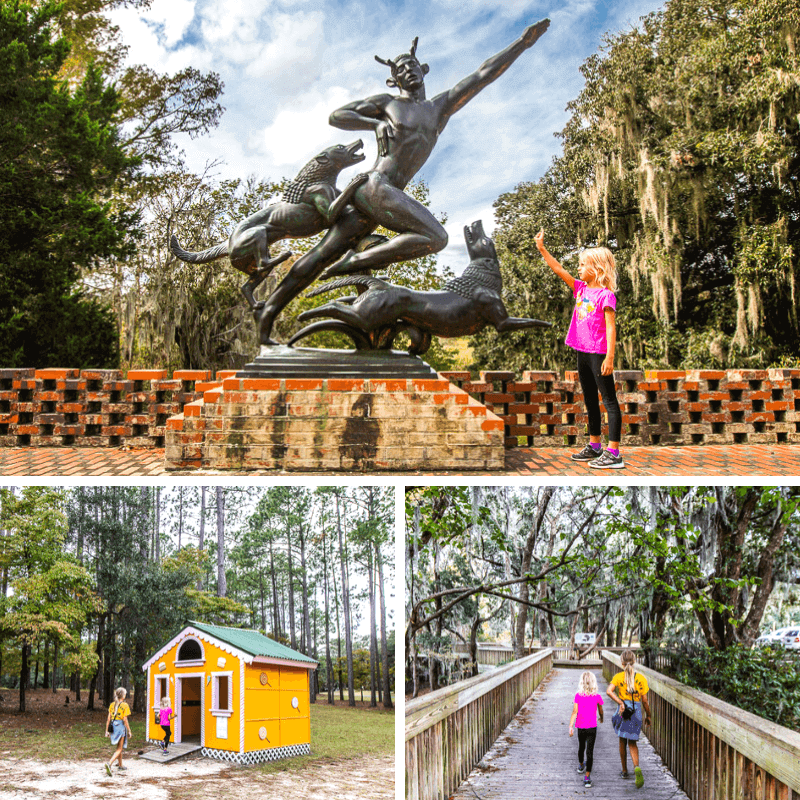 If you’re looking for places to visit in Myrtle Beach that provide your own space and tranquility, then head to Brookgreen Gardens. This is a national historic landmark that hosts the largest collection of outdoor American sculptures in the world. You may think that sounds like a lot of art to look at it – it truly is. The collection contains over 2,000 works by 425 artists over the 9,127-acre property. There is also a small zoo, an Enchanted storybook Forest, a butterfly house and boat rides and trekker excursions taking you deeper into the property. 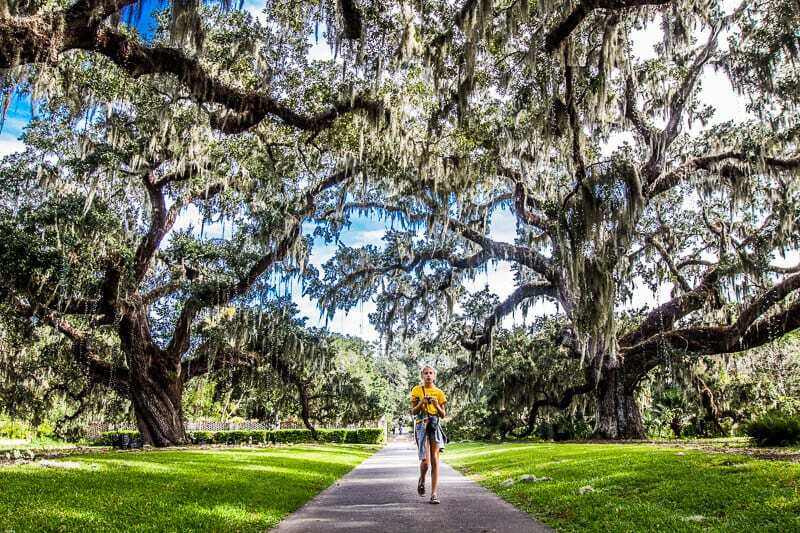 Don’t miss Live Oak Allée, which is comprised of 250-year-old Live Oak trees with weeping Spanish moss that were planted in the early 1700s when Brookgreen Gardens was four thriving rice plantations. There is a great activity booklet for the kids to keep them engaged with various scavenger hunt type questions. So if you’re looking for more things to do near Myrtle Beach, consider here. The small fishing village of Murrells Inlet was once the lair of the infamous pirate Blackbeard. It’s located right near Huntington Beach State Park and Brookgreen Gardens so it abounds in natural beauty waiting for you to explore. I loved its Southern coastal vibe. I wish we had more time to explore it. There are plenty of water sports to do in the area including parasailing, jet skiing, and fishing charters. I love the look of this guided stand up paddle board trip around the beautiful waters of Murrells Inlet. 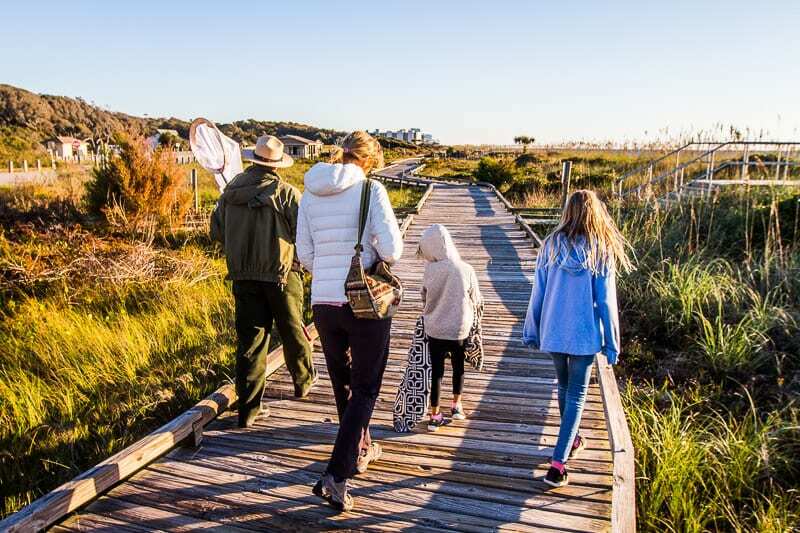 There is a half-mile-long Marsh Walk, which has gorgeous views of the marshlands and the fishing boats coming in with the day’s catch pulled from the surrounding waters and sent straight to the restaurants. 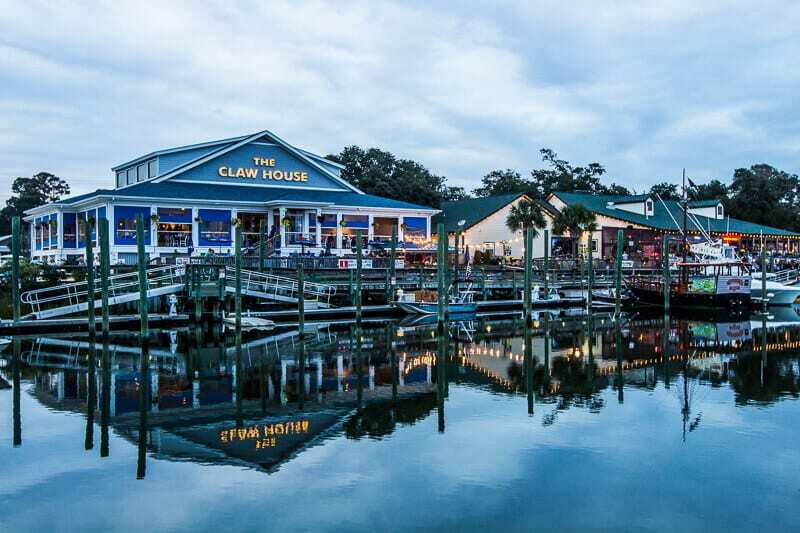 It’s the place to be after dark for seafood, drinks, and relaxed southern fun. 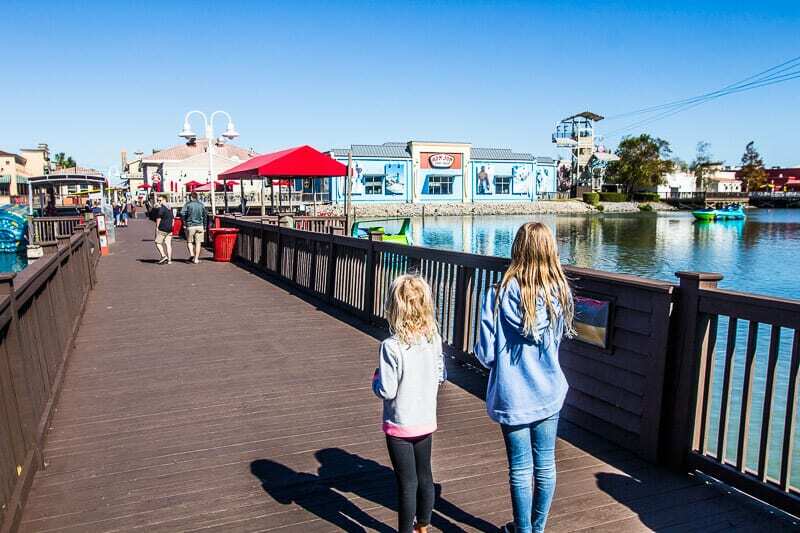 Broadway at the Beach is the place for shopping, restaurants, nightlife and family entertainment, all of which border a 23-acre lake. Here you’ll find plenty of things for kids to do in Myrtle Beach like Ripley’s Aquarium, WonderWorks, Margaritaville, and Hard Rock Café. A must do in Myrtle Beach, beyond the beach! When I first saw the upside-down building, I thought what Las Vegas style rubbish is this? Who would want to go into something so kitschy and gaudy? Never let ignorance get in the way of a good experience. I had no idea what that upside-down building was – I thought it was just that, an upside-down building with probably arcade games in it or something. But alas no, inside it are three levels of imagination, experiments, and adventures. We’ve visited a few interactive science museums before, but WonderWorks has to be one of my favorites. There is nothing boring or kitsch in here, and each station and activity teaches you something interesting about life. Not sure what to do in Myrtle Beach in bad weather? It’s one of the Myrtle Beach attractions perfect for those rainy days that take you away from Myrtle waves! 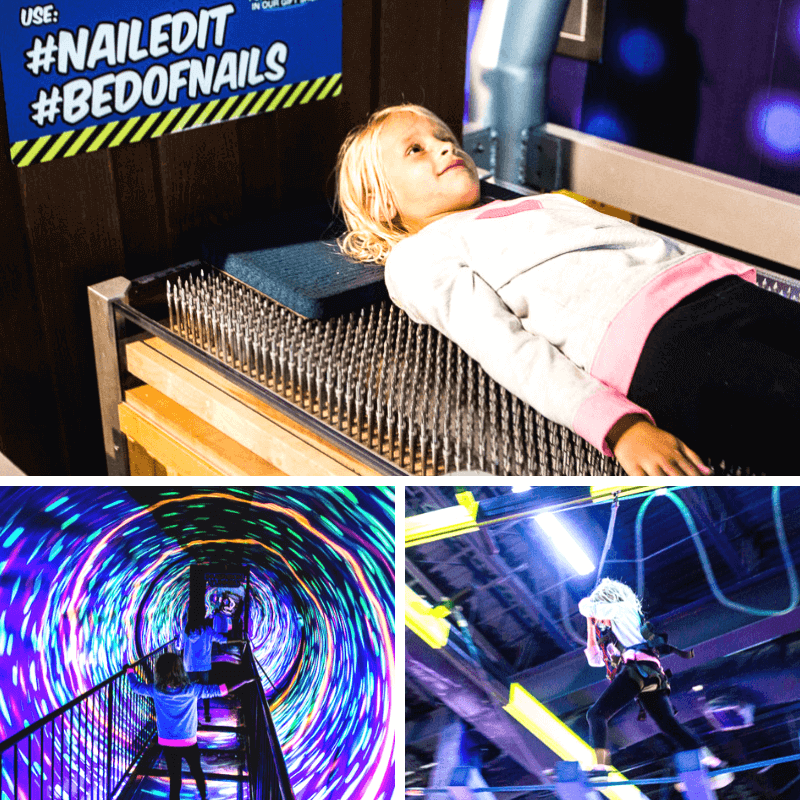 We learned why those bed of nails we were lying on were not piercing our skin, how high we could jump, how good we were at shooting basketball hoops, and who was our celebrity doppelganger (Jane Fonda for me!). We got to feel what a hurricane could potentially feel like, just how cold the water was when the Titanic sunk, and how to push the limits of electrical understanding. Thank you, WonderWorks, for taking care of much of my homeschooling curriculum for the month – I was very excited to see Kalyra do very well in the weather and natural disaster quizzes! Our two favorite activities were of course the high ropes course. I’m getting braver with each one we try, and the girls practically run across them now without holding on to anything! And then there was laser tag. It’s always a fun game to play as a family. I was stunned to walk out as the winner with a score three times as high as the others. I guess I liked the rapid-fire function!! 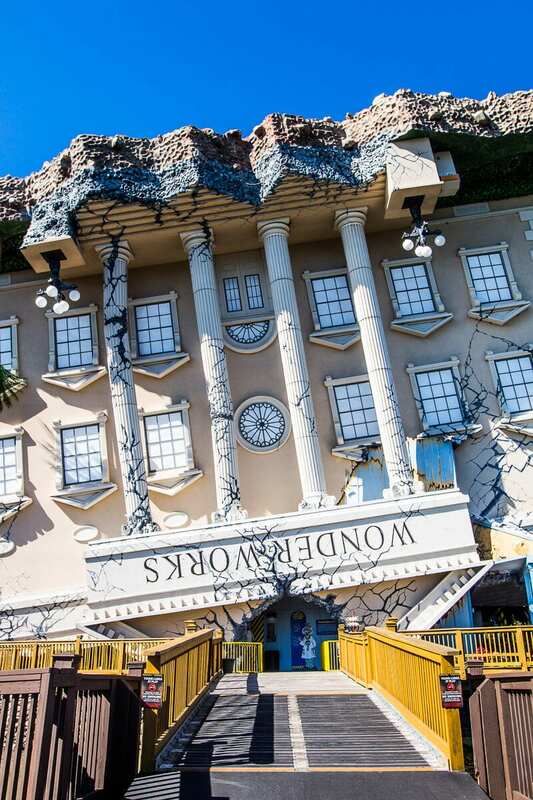 WonderWorks is definitely one of the best things to do in Myrtle Beach with kids. Get your all access WonderWorks pass here. 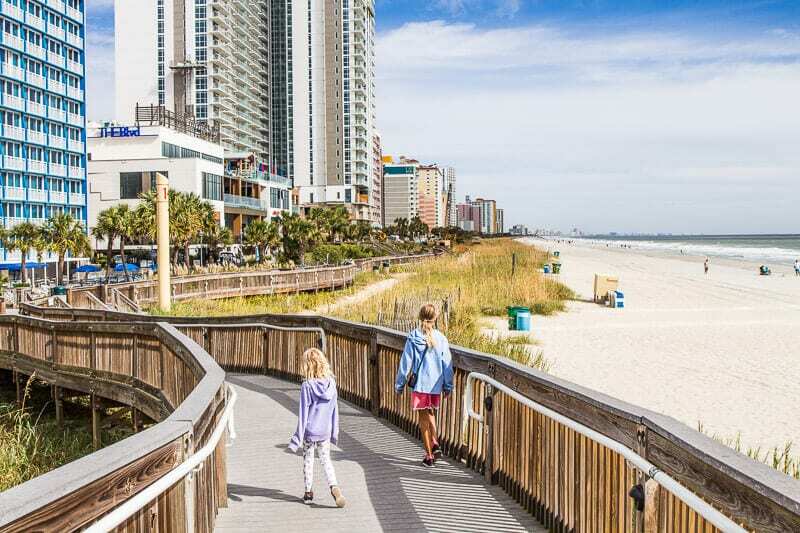 Along the main shoreline is a 1.2 mile stretch of Myrtle Beach boardwalk and promenade. There are two main sections: one is a more serene, natural environment, and the other is focused on fun with beachfront shops, restaurants and the iconic 200-foot SkyWheel. For nostalgic fun pop into the Fun Plaza Arcade, or grab a hot dog and a milkshake from Peaches Corner, a staple since the 1930’s. The SkyWheel is a gigantic observation wheel that stands out in the cityscape. There are 42 glass-enclosed gondolas that can seat up to six people. The ride goes for about 10 minutes and you get beautiful views of the Atlantic Ocean and up and down Myrtle Beach. 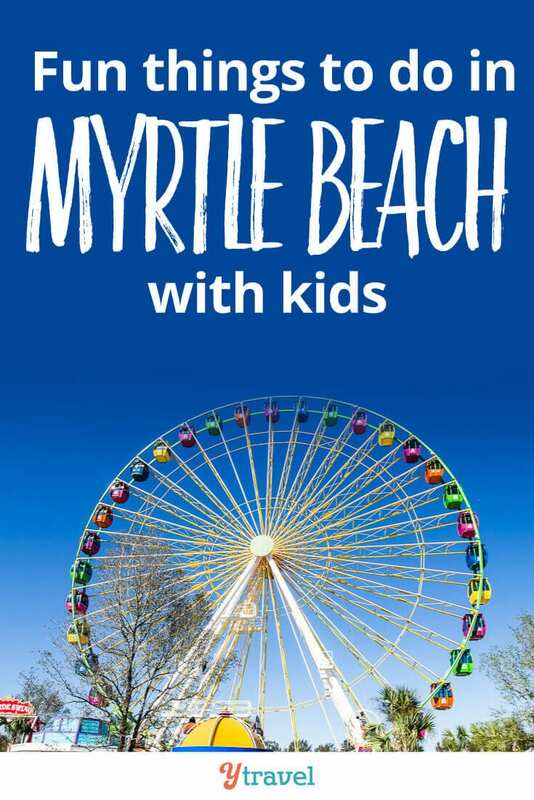 Get there early so you can almost have the entire wheel to yourself and enjoy one of the relaxing Myrtle Beach family activities! Kalyra and Savannah are tumbling addicts. They attend tumbling classes when we’re in Raleigh and are forever practicing their back handsprings and front tucks. I am forever trying to remember which one is which! 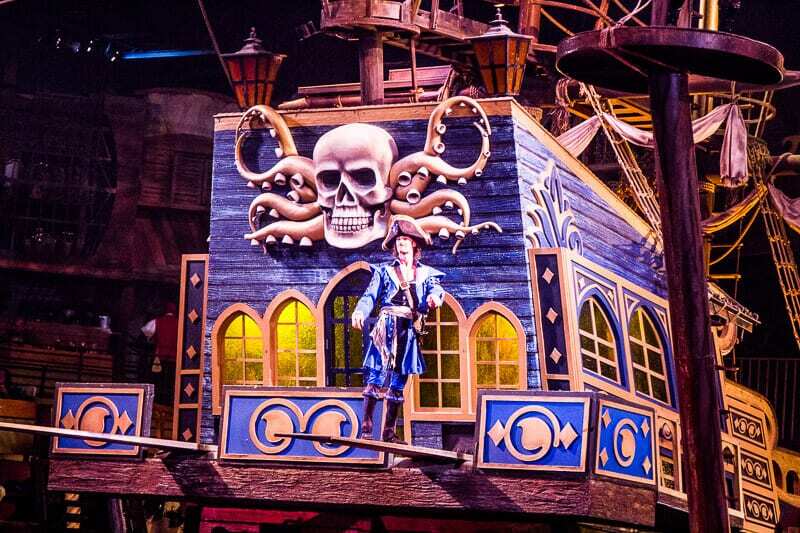 As soon as the Pirates Voyage show started and the pirates in front of us began tumbling, back tucking, back handsprings and more amazing acrobatic tricks, I knew we had arrived at the right show. The girls were mesmerized the entire time. Savannah would not let me touch her head after the performance, in case I erased her memory and interrupted her dreaming of life as a back-handspringing pirate in a dinner show. Needless to say we loved the Pirates Voyage Show. 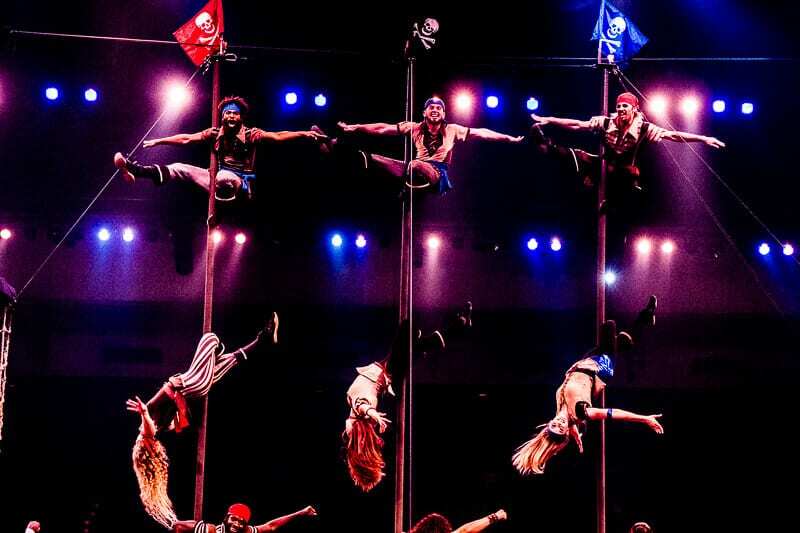 It’s 90 minutes of acrobats, juggling, special effects, singing and cool lighting. All of this happens while you eat a four-course meal. Craig and I even volunteered to participate in the water bucket relay race. Unfortunately we did not win, but had fun splashing more water on ourselves then in the buckets. It’s the pirate life for me! 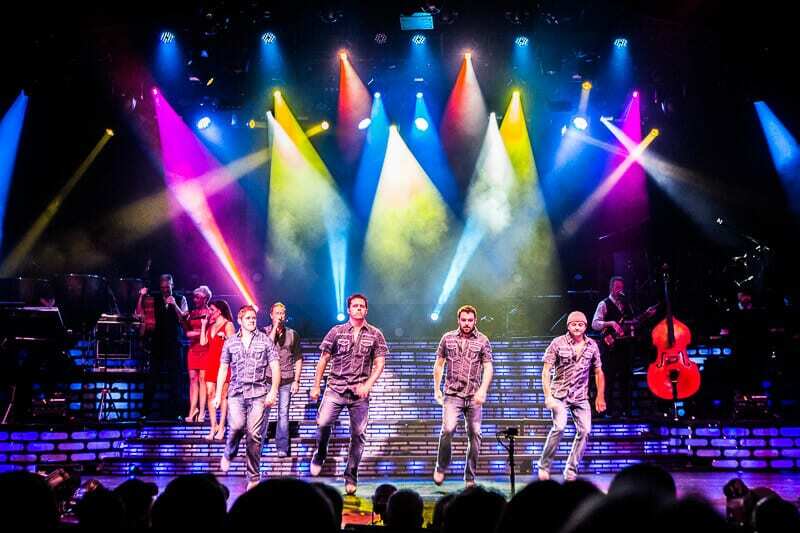 Put this on your list as one of the fun things to do in Myrtle Beach at night. Click here to discover other Myrtle Beach attractions like miniature golf courses, Museum of South Carolina, an oceanfront water park and an amusement park (with the Twist & Shout roller coaster). If you like singing, dancing and comedy, then consider a night at The Carolina Opry. We love taking the girls to the theater and the Opry in Nashville so we knew we’d enjoy this evening. I love how the music spanned multiple genres and ages like soul, country, and pop and rock. My favorite was the Elvis section and This is Me from The Greatest Showman! It was quite the performance with all the cast involved in the singing and dancing. Savannah was mesmerized by the guitar playing throughout the show. She has her own guitar now so I loved how this show motivated her to keep practicing. The Carolina Opry is a kid-friendly Myrtle Beach attraction. Get your Carolina Opry Tickets here – they also have a popular Christmas themed show. See more here. We had a delicious seafood dinner at the slightly upmarket Wicked Tuna which is in the MarshWalk. 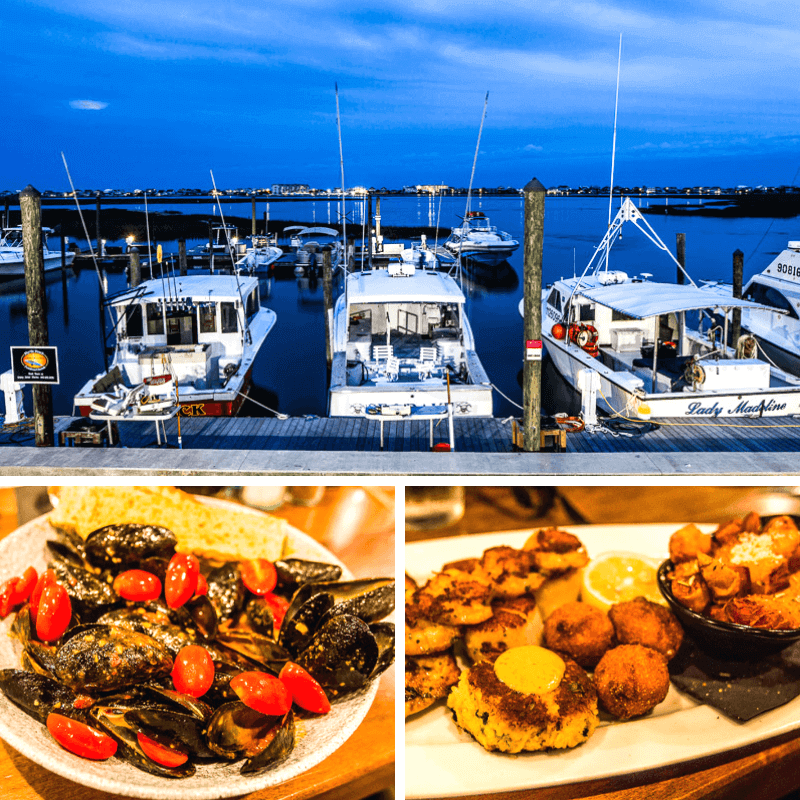 As Murrells Inlet is known as the seafood capital of South Carolina, it was the perfect dinner choice. The seafood at this restaurant is straight from hook to table. They have seven boats that go out each day to bring back the best of the local catch. Craig, Kalyra and I couldn’t get enough of the mussels in a bacon tomato broth, and our grilled seafood platter was delicious, especially the tender sea scallops and local sweet and flakey, triggerfish. Are you ready for some of the best waffles in America? According to the Food Network, the red velvet waffles at Johnny D’s rank amongst the nation’s best. Chef and owner Jamie Saunders’, creates innovative dishes like these and her chipotle bacon eggs benedict. She is also an active supporter of the Champion Autism Network and trains her staff to accommodate families’ needs for those with children on the autism spectrum. 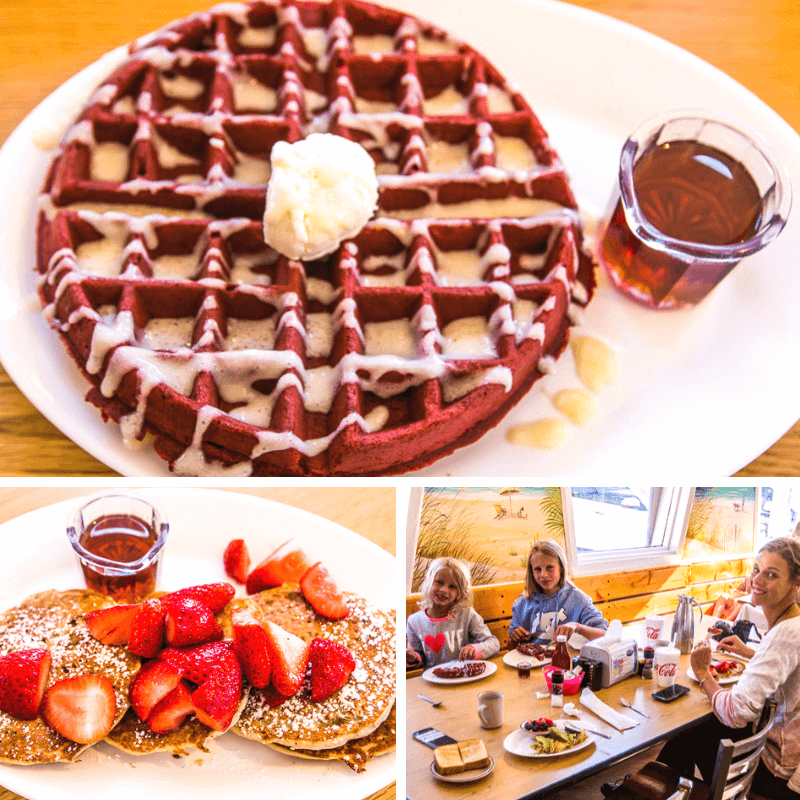 Good news for gluten free pancake lovers – if you’re looking for places to go in Myrtle Beach there are gluten free strawberry and banana hot cakes. 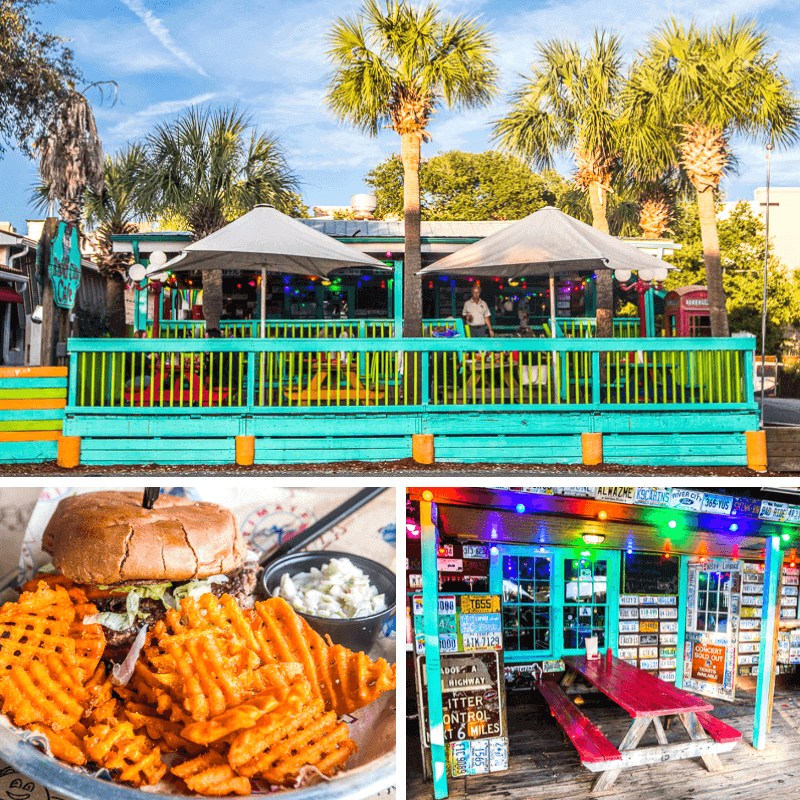 The River City Cafe is a relaxed place to eat a wide variety of burgers. I like the colorful outdoor seating area of the location we visited on 21 st Avenue North. There are a few throughout the Myrtle Beach area. Eating here is quick, easy and affordable. 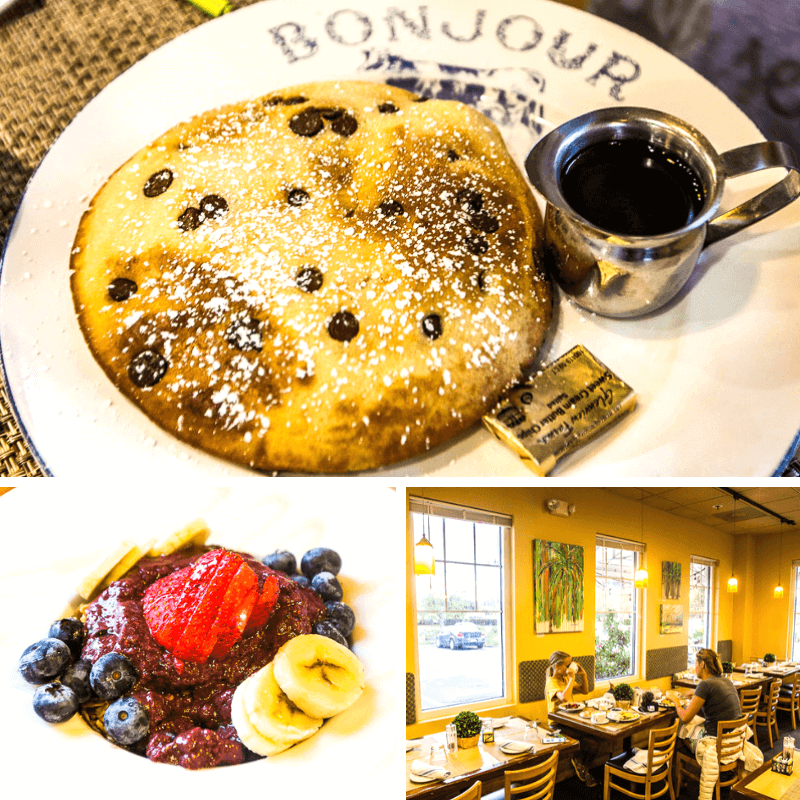 For a French-inspired breakfast head to Croissants Bakery and Bistro. Some of their signature breakfast menu items include pancakes, eggs benedict or bananas foster french toast. Chef and owner Heidi Vukov is committed to preparing and serving fresh local vegetables, fruits, seafood and meats. We appreciated the friendly service here as well. Be sure to take some macaroons home with you when you go. They are truly delicious! We loved our Island Vista Resort home for our three-night stay. It’s a few miles north of main Myrtle Beach, and the only hotel for nearly a mile in either direction making it feel like a secluded slice of paradise. It’s on the beachfront and has an indoor and outdoor pool (heated in the cooler months) and spas, including a lazy river, waterfall and kids splash area. And the sunrise view from our balcony was amazing! We loved the apartment style suites. We had plenty of room and our own space. There were two bedrooms, a living room, large kitchen, and a balcony with ocean views. There is also a pool bar for drinks and snacks. Book your stay at Island Vista here. Check out more accommodation in North Myrtle Beach and Myrtle Beach. Got any tips on the top things to do in Myrtle Beach SC? 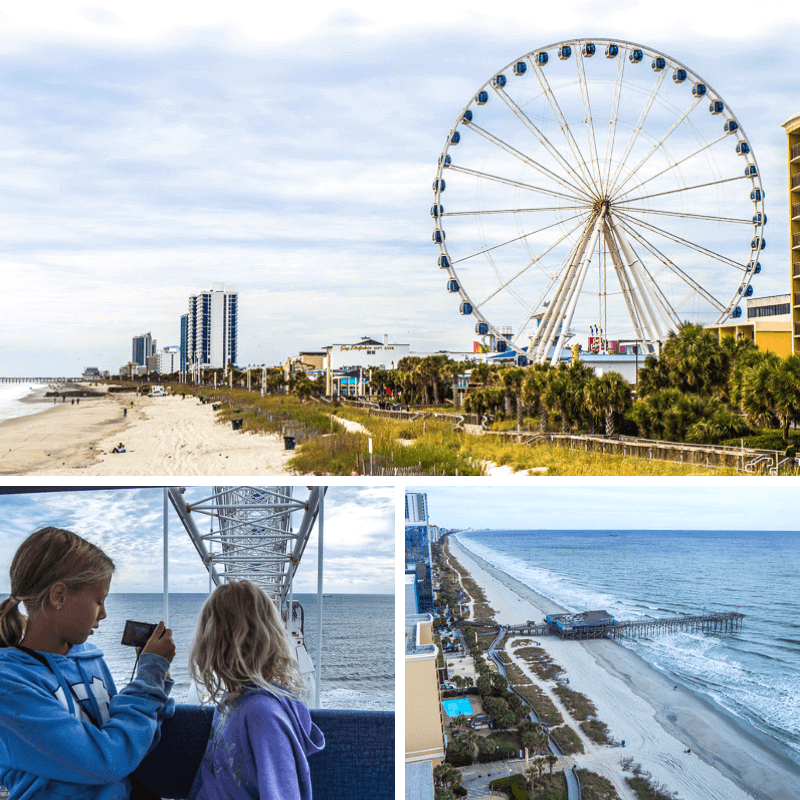 What do you think are some of the best attractions in Myrtle Beach South Carolina? Please comment below.